My fourth-grade teacher at Harrison Hill Elementary, Mrs. Burkett, accused me of being a daydreamer -- as if that were a bad thing. I grew up with teachers trying to get me to focus and pay attention while I was off in some different reality. Thankfully, they didn't put me on Ritalin or some numbing compound to keep me in line. Though I appreciate the need for students to stay focused, I believe our dreams are what drive our actions. Case in point: Ten years ago, I was daydreaming about plein air painting, which was fairly new to me. It seemed like there were a lot of people doing it, yet there was no sense of community, no focal point. My vision was to create such a focal point, one that could capture, reflect, and encourage the movement. Of course, everyone I spoke to told me I should focus my attention on something more productive. Action Note: That is always a clue. If people think your dream is silly, you're on to something! I persisted, starting a magazine called PleinAir. When I announced it, everyone told me every mistake I was making and explained why it would fail. Even people in my own company thought it was a bad idea. I persisted, because I believed in it. The same happened with Fine Art Connoisseur, and with the PleinAir Salon, when I said I wanted to give away $20,000, and with the Publisher's Invitational, when I said I was going to create an event for painters to just play and paint. Action Note: You must believe strongly in something and take it full speed ahead in spite of discouragement from others. Your belief and vision is something others don't have. When I decided to launch the Plein Air Convention, I had this daydream of an event where artists from all over the world could gather and paint together, break a world's record for the most plein air painters painting in one place, and bring in the finest artists in the world as instructors to help all the painters improve. I met with extreme resistance, naysayers, and continual roadblocks, yet by persisting, we accomplished the goal and created a world-class event. We're holding the second one next week. This year, when I wanted to double the number of instructors (we have 70-plus), add an extra day, add a plein air beginners' course and add a meeting called the Umbrella Group to grow plein air overall, I again met with resistance. But what I have learned is that I have to stretch and always try to top myself. So I announced them. Action Note: If you believe in something, make a public commitment to it so you are forced to make it happen. Be willing to put your credibility on the line for what you believe. Marketing and selling art starts with ideas. I believe one of the problems in the art world today stems from the lack of new ideas, and too many people clinging to the old ways. If you want to win big, then you should dream big. Don't let the old standards, the "way things have always been done," become a damper on your success. Reinvent with new ideas, then follow them with vigor and conviction. You will succeed. A few weeks ago, a painter friend was seeking a way to sell a lot of paintings fast. When he saw retirement announcements for a bunch of executives from a big corporation in his town, he had an idea. He called the CEO and suggested the best retirement gift he could give was a painting of the area from a local painter, knowing the retired executives would look at that painting fondly every day for the rest of their lives and take it wherever they might go. When this artist asked his friends about the idea before calling the CEO, they told him all the reasons it would fail. But he made the call anyway and sold seven commissions, with more to come. Throughout my career in radio broadcasting, publishing, marketing, and art, I have encountered resistance to every good idea. Though I have had failures, failure is nothing more than a stepping stone to growth. If I had stopped dreaming because of a failure, I would have missed doing my little part to change the world. Don't let anything get in the way of your dreams and ideas, and when you fail, stand up with pride, dust yourself off, and get back in the game. Dreams develop ideas. Ideas make dreams come true. Be a dreamer, use ideas to sell artwork, and you'll set the world on fire. 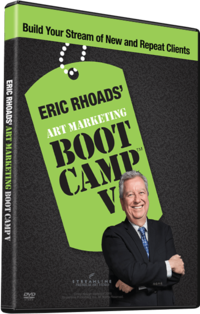 PS: I'll be doing my Marketing Boot Camp II, the next edition of my Marketing Boot Camp, LIVE at the Plein Air Convention. Everyone attending the convention gets to attend Boot Camp for free. This year I'm focused on the next level: one day on branding and its importance to artists, one day on social networking and selling via the Web, and one day on how to get into art galleries and grow your business. Last year people kindly told me the marketing sessions alone were worth the price of the entire convention. One painter I know has had a booming year because she followed the program I suggested. If you cannot attend, you can at least see last year's sessions on DVD. P.S. I also have a blog for art galleries.